Isla Mujeres is one of the most enchanting destinations in the Caribbean and dolphins are one of the most enchanting animals in the ocean. Put the two together and you have one winning combination. Whether it's a kiss, a belly-ride or a song, our dolphins will win your heart. Get ready for a real dolphin adventure with this amazing combo. 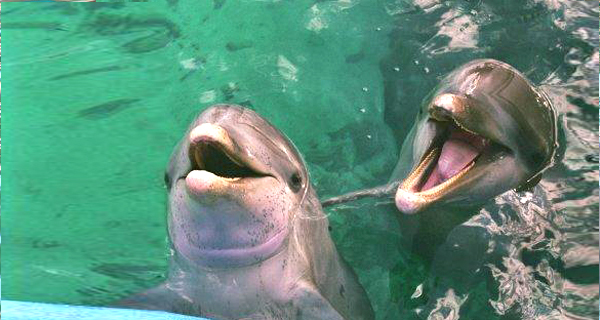 Shake hands with a dolphin and then hold on to your new friends dorsal and let him tow you through the water. Also enjoy some snorkeling fun and many other activities in Garrafon Reef Park. Visit our gorgeous marine mammal facility on Isla Mujeres to enjoy swimming with the Dolphins on our premier dolphin swim program. In addition to frolicking with the Dolphins, youll have the chance to encounter the gentle manatees and visit the beautiful beach club to snorkel with sting rays and even sharks. Our Dolphin Royal Swim Combo takes you to Garrafon Reef Park on Isla Mujeres where two of our dolphins are waiting to take you on a breathtaking ride. Experience the thrill of a dorsal tow and a foot push and get to know some of our beautiful animals!